A secondary school in Hull is to be put into special measures for the second time in five years. Governors at Endeavour High School in Beverley Road met on Wednesday night to be told the outcome of a recent visit by Ofsted inspectors. Despite an improved GCSE pass rate, from 9% to 35% over the past five years, inspectors have concluded the school is making inadequate progress. BBC News understands the school plans "a robust response" to the decision. Nobody from the school or Ofsted was prepared to comment until the report was published. An Ofsted spokesman said the report would be published five working days after the school received it. Under the terms of special measures, Endeavour School will now be given an action plan by inspectors and the school will face more monitoring visits. 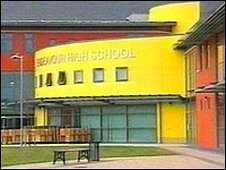 The school was made the subject of a notice to improve in March 2008, when inspectors asked it to improve achievement and raise standards, including attendance and students' rate of progress. Inspectors then made a monitoring visit in November and said it was making satisfactory progress. Results at Endeavour have improved steadily, with 35% of pupils achieving five A star to C grades in the GCSEs last year, up from 9% in 2003. This year the school is predicting a figure of 50 to 60%, its best results to date.